Have I ever told you I used to subsist on ice cream as a child? Because I totally did. Imagine 7-year-old me sneaking in a twist cone every chance I got (and believe me, I got a lot of chances). The funny thing is I was lactose intolerant for the better part of my early childhood, which means somewhere along the line I decided I was going to eat dairy anyway and I don’t think my parents had the heart to tell me no. So ice cream it was, until several years ago when my body shut the whole operation down. Sad day. Good news, though – I don’t even miss it anymore! 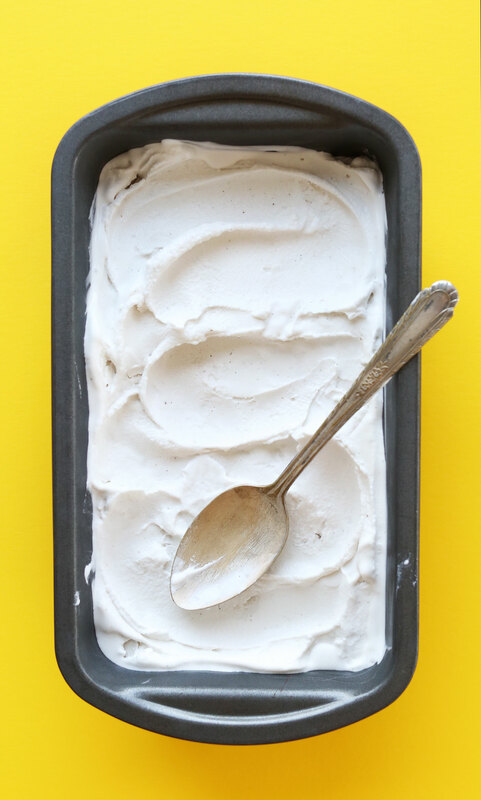 Especially not with dairy-free alternatives like vegan parmesan cheese, coconut whipped cream, and ice creams like this one that are classic, creamy, and undetectably vegan! I’ve been wanting to make a vanilla coconut ice cream for a long time now, seeing as I’ve only done flavors up to this point (see all of them here). This version is so simple and quite possibly my favorite yet! It requires just 5 basic ingredients and simple methods. There’s even an option for those of you who don’t own an ice cream maker in the notes. 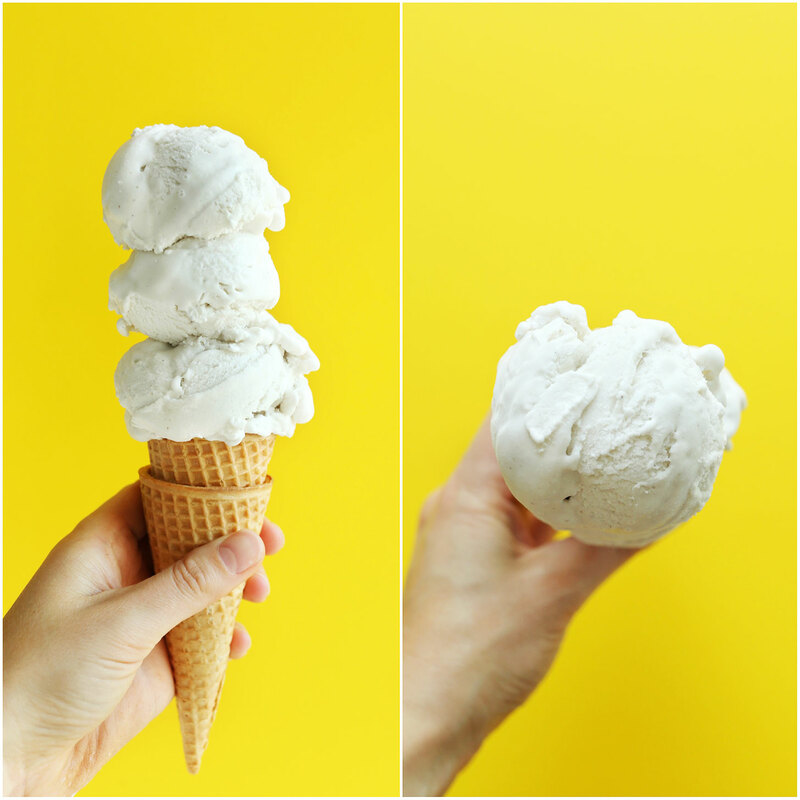 This ice cream just screams vanilla, infused with both vanilla bean and vanilla extract. Not only does this combination add more flavor, the extract (which typically contains alcohol) helps prevent ice crystals. The result is the perfect creamy, dreamy coconut ice cream. This is the perfect ice cream to make when you want a basic non-dairy ice cream. It pairs well with cake, pie, would make a killer ice cream sandwich, and makes the ultimate base for vegan milkshakes (new recipe coming soon!). If you try this recipe, let us know how it goes! Leave a comment and rate it, and don’t forget to take a picture and tag it #minimalistbaker on Instagram. We’d love to see what you come up with. Cheers, friends! Perfect Vanilla Bean Coconut Ice Cream! Just 5 ingredients, simple methods, and insanely creamy results! The day or night before, place your ice cream churning bowl in the freezer to properly chill (see notes if you don't have an ice cream maker). The following day, add coconut milk, organic cane sugar (sub up to half with natural sweetener), sea salt, scraped vanilla bean and vanilla extract to a high-speed blender and blend on high until completely creamy and smooth for 1-2 minutes to fully dissolve the sugar. Add more cane sugar or agave if it needs more sweetness, or more vanilla if it needs more vanilla flavor. Add mixture directly to chilled ice cream maker and churn according to manufacturer’s instructions - about 45 minutes. It should look like soft serve (see photo). See notes if you don't have a churner. Once churned, transfer the ice cream to a large freezer-safe container (such as a loaf pan) and use a spoon to smooth the top. Cover securely and freeze for at least 4-6 hours or until firm. Set out for 5-10 minutes before serving to soften - a hot ice cream scoop also eases scooping. Will keep in the freezer for up to 10 days, though best when fresh. Pairs perfectly with pies, cakes, cookies and more! *I like Trader Joe's Coconut Cream, but you can also use your favorite brand of full-fat coconut milk. Coconut cream, however, will yield creamier results. *Because some readers had trouble with the coconut oil separating when chilled, I've updated the recipe to exclude it. I also recently retested to include the option to use coconut cream instead of coconut milk, and agave for up to half the cane sugar. These changes are reflected in the current recipe. 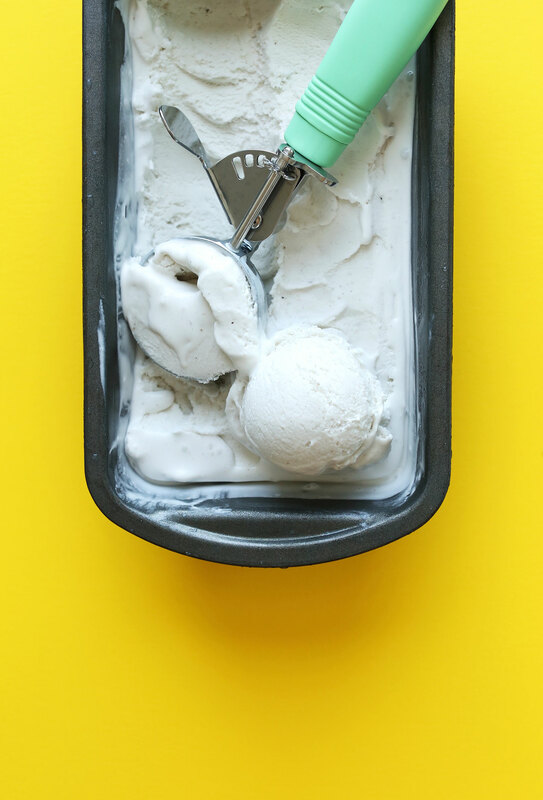 *If you don't own an ice cream maker, you can add chilled mixture to a freezer-safe container and freeze. Once every hour, remove from freezer and stir /whisk to incorporate air. Repeat until mostly firm - 6-8 hours. Then continue freezing until completely firm before serving. It won't yield as creamy results, but it should still work. This did not come together for me at all. I blended all the ingredients together as directed (at room temperature), then poured the mixture into my ice cream maker. It seems like maybe something curdled? Or maybe I over-blended the mixture, even though I did it for less time than suggested? I ended up with what looked like chunky ricotta cheese, just chunks of frozen coconut fat, that got stuck in the middle of the ice cream maker, and frozen paste on the walls. I let the machine go for 20 minutes and tried scraping the contents around several to get things to redistribute and move, but it just kept rotating with an incorporated mass of coconut chunks in the middle. Sad to waste the ingredients and time. I read after the fact in the comments that others only had this recipe work if they chilled the mixture first. Maybe that’s what went wrong, but I don’t think I’ll be trying this again. Hi Bethany, Sorry to hear this didn’t work out for you! Have you used your ice cream maker successfully with other ice cream recipes? Sometimes when it sticks to the walls, that can indicate a malfunction with the ice cream maker. I’m so excited to try this recipe tonight. I love all ice creams but have been on a coconut-milk kick for a while and am sick of pay at least $7 for a tiny container! I plan to add toasted coconut flakes, chopped almonds, & probably some chocolate chunks. When is the best time to add those? Thanks so much! I put in those “add-ins” after the ice cream has firmed up quite a bit, but not completely done. If added in in the very beginning then everything sinks to the bottom. Not the end of the world, but not ideal either. I, too, am tired of spending almost $10 on vegan ice cream. Can’t wait to try it, too. the bad thing is after a night in the freezer it’s rock hard! and never will be like it was when it was freshly made. I just have to say your recipes are amazing. I have yet to be disappointed and I have tried quite a few already. So excited to have stumbled across your vegan ice cream recipes. Just wondering if you have had any success with a vanilla ice cream without a coconut base? I’m just not a huge fan of the coconut flavor. I was wondering about why it doesn’t say to heat it while it does say cook time in the prep? I’ve read recipes where they say to heat it is why I asked. I don’t like coconut flavoring can I add to the recipe to try to cover it up and still have vanilla? I picked this recipe because I have dear friends who are staying away from dairy, but wanted them to still enjoy dessert at our dinner party. I have made severa batches of homemade ice cream wih my ice cream maker, so I am no stranger to the process. However, this recipe failed to pass the test. I followed the instructions to the letter, apart from the vanilla bean pod, and after an hour and 15 minutes in the ice cream maker the mixture was barely the consistency of a thin milk shake. Don’t get me wrong, it had a fantastic flavor and my friends enjoyed their “shakes” . But it wasn’t the ice cream I’d intended for dessert. We are sorry to hear that! I’m not quite sure what went wrong.. I think this recipe is missing a step compared to a past version. For it to work correctly in the ice cream machine, the mixture needs to be chilled for a few hours before putting it into the ice cream maker! This recipe came out delicious! I used 1 tbsp vanilla bean paste in place of the scraped vanilla bean, definitely added to the sweet vanilla flavour but still was coconutty enough to enjoy both flavours. The cans of milk I used had a big clump of cream and the rest was just water so I used the cream because surely the water would make it not work. Will try this recipe again because it came out delicious but I will try and use the coconut milk that IS all milk or I will have to use 4 of the same cans that I used to increase the yield. Took about 10/15 minutes in my ice cream machine because the paddle was freaking out lol. So easy to make and do delicious! can I add frozen fruit to this recipe and how do I do that with an ice cream maker? I think so! We haven’t tried but another reader above did! Hi Annie! The coconut flavor is definitely present, and if you aren’t a fan of coconut I probably wouldn’t recommend! Could this be made without any sweetener or does that affect the chemistry? I actually like how coconut cream tastes unsweetened, plus will be putting swirls of honey/cinnamon in mine, but wondered if I had to have sweetener in order for the ice cream to turn out as ice cream. Hmm we haven’t tried making it without sweetener, but if you experiment with it, report back! Good luck! No. No way, I thought. Then I actually made it and wow. It’s actually a bit unreal because I can taste the dairy — that’s how real it tastes. I used one can of c. cream and one can of c. milk (because that was all I had) and it came out fantastic. Used vanilla powder but everything else was the same. Came out amazing in the cuisinart ice cream maker and now that I know how easy it is to make I’ll always have cans of coconut products on hand, with my bowl in the freezer! Seriously, thanks. Now on to the waffle recipes! Yay! Thanks for sharing, Matthew! For me second time was the charm. The first time I attempted to make this ice cream I used coconut milk that was over a year old so the whole can had gone solid. The texture turned out to be terrible (my dislike of the texture was bigger than how much I liked the taste) and it didn’t feel great to throw it away. This time however I used a can of coconut milk that I had bought less than a month ago. Only a portion of it had gone solid. It was a pleasant surprise as there is no mention in the recipe on what the texture be like with liquid (good) vs solid coconut milk (horrible). I think that’d be good to mention in the recipe. After freezing it I noticed that scooping it out is harder than what it’d be like to scoop out store-bought vegan ice cream. Tho that’s pretty much nitpicking as this is a 5 ingredient DIY recipe. The texture is still close enough to store-bought so it didn’t hinder the experience. There’s still a certain charm to making ice cream at home and the taste is great! I must admit that the amount of saturated fat in the ice cream makes me a bit uncomfortable though (I know, it’s mostly coconut milk so it’d be silly to expect anything else). I’m rating this recipe as a solid 4/5. It’s not perfect but that’d be unreasonable to expect. It’s still delicious and I’ll definitely be making more of this some other time too! Hi, I was wondering if you can replace the sugar with coconut sugar, would this work? Hi Denise! You could try substituting coconut sugar, or maybe even brown rice syrup. We haven’t tested these options, but they would be our top next choices! I’ve made this recipe for several summers in a row and it’s my all-time favorite home-made ice cream recipe! I’m about to make the first Summer of 2018 batch and I can’t wait! Made this as a first time recipe for an event we were hosting at work. Not only did it go down well with everyone but somehow it earned me the best dish at the event. I have guided my work colleagues to this page if they want to make their own. I made this and it came out perfect. We have a Cuisinart ice cream maker and it took 30 minutes of churning until it quit moving the ice cream. We put it in the freezer and could only wait about 2.5 hours to try it. it was creamy great!!!! The next day, we set it out for 10 minutes and it was perfect again. And then it was gone–going to make it again very soon. Changes: I didn’t have a vanilla bean and simply increased the vanilla extract a little. I used full-fat coconut milk. Can we exchange one of cans of coconut cream for cashew milk? I have a family member that is vegan and trying to lose weight and she really misses ice cream. She is very calorie conscious and I am trying to find a recipe for her. This is INCREDIBLE. This was my first ever batch of ice cream in my Cuisinart machine, and it certainly won’t be my last. I put the mixture in the ice cream maker for 43 mins, and the consistency was just like ‘real’ ice cream. Next time I may try adding some key lime juice for a key lime pie ice cream. This makes good ice cream but you have to be super careful at the whipping stage as many have noted. We used organic coconut cream with no guar gum and even at room temperature had it curdle badly. Pretty substantial waste of vanilla bean, vanilla, and coconut cream. We had better success hand whipping with a whisk so it can’t curdle in a blink on you. My son loves vanilla ice cream but I’m looking for a healthier version. I usually manage to get coconut flavors into his meals without too much objection so I’m going to try making this ice cream for him.I’ve been trying new ice cream recipes in ice cream makers. Personally, I think the coconut and vanilla flavors look delicious, so even if he doesn’t take to it (he is a fussy eater!) I’ll be enjoying it. I love that it’s only 5 ingredients too. We hope you and your son both enjoy this recipe, Edwina! I made this and it came out like a brick of ice. It was completely un-scoopable. Not only that but it took me 45 minutes of blending and puréeing to get the coconut full fat to stop separating. After over an hour of following the recipe step by step and waiting hours for it to freeze it was a brick. I even tried to thaw it and add oil the next day. Still a brick. With the coconut cream , I don’t have to add in the 2T of tapioca flour as they mentioned it in some recipes with the coconut milk can right? Thank you so much! Nope! Our recipe does not call for tapioca flour. HI Dana, thank you very much . After following exactly your recipe, it came out very good (around 15′ with the cuisinart ice cream maker). The only diff is I mixed all the ingredients a night before and left it in the refrigerator at the same time with the ice cream churning bowl (in the freezer) for 24 hours. I just made it 3 hours ago, and hope the texture will be smooth and good for the next day. Hello! I’m interested in this recipe but curious if there would be a way to reduce the saturated fat? Not that we’re aware of, as the recipe requires coconut cream! If you try something out, report back! I just finished making this, and it’s in the freezer. I did taste it and it’s very good! Awesome basic iced coconut cream, I will experiment with different flavors next…I’m thinking banana or guava. I’ve had the mixture in the fridge for a couple of hours and then ice cream maker container in the freezer for over 8 hours. I went to churn the ice cream and it still very runny. Is this normal? Will it become a proper ice cream after it’s been churned and put in the freezer for 3-4 hours? This is a fabulous recipe as is. Try adding 30 gms of melted cocoa butter at the end of blending. We also almost halve the sugar and it’s still absolutely delicious. First of all, thank you for this amazing resource!!! Secondly, I want to make this for a vegan dinner party I’m going to in a few hours, and I didn’t read through the recipe until just now… I don’t have 4-6 hours to chill this in the freezer, but my ice cream maker bowl is chilled and ready to go. Do you think I can get away with leaving this in the frozen bowl and popping it in the freezer until dessert time? With vanilla beans being priced the way they are ($23 at Traders for 3) where can I find vanilla powder? I can’t seem to find it but was not happy with just vanilla extract….thoughts? What brand do you use? Is there sugar mixed in with it or straight vanilla only? I love all your recipes, photos, and advice! I do try to make your food as soon as I get your email but now I’m in a bit of a bind. My son has recently been diagnosed with type 2 diabetes and has been very good at keeping to his diet ever since. but of course, he misses his desserts and has had zero for the past few months, including most fruits. He loved ice cream though, and I thought this may be a good one for him to try since it’s coconut based and sure not to have any hidden carbs in it. But, I need to tweak it to suit his medical needs. Would using stevia instead of sugar work here? He’s found that he’s sensitive to agave so that option is out for the moment. Hi Ramona! Others in the comments gave stevia a try and did not have much luck! Take a look when you get a moment! Good luck! Eeek! Any suggestions on what diabetic friendly (and healthy!) sugar substitutes I could use? I will also experiment with frozen fresh fruits like banana or dragonfruit processed into a puree. I think they’d complement the coconut vanilla flavor and not change the color at all. Just won’t be as sweet. BTW, coconut sherbet using the water plus shredded and pureed coconut flesh is delicious. You may want to give that a try. I’m still trying to figure out what sweetener would work with that recipe. Thanks for pointing out the stevia problems! My dad has diabetes therefore I usually use the coconut sugar to substitute for the regular sugar for baking, cooking, making ice cream since its has lower glycemic index (35). Hope it helps! So the cream of cononut does not work by its self . You need to add coconut milk in order it to freeze. Would I be able to substitute the sugar for stevia? Hi Much! Yes you can! Substitute it for 1/2 teaspoon of stevia! Just tried the newer recipe (dated June 2017) and it split right when I turned on the food processor. I even used the recommended Trader Joe’s coconut cream! I ended up heating the mixture over the stove to get everything to mix together and chilled in the freezer for about 2 hours. Just took it out of the ice cream maker and it turned out great! Feels a little gritty (could it be the granulated non-organic sugar I used?) but it tastes delicious. Pairing it with a white chocolate chip macadamia nut cookie–I think it’ll be a hit! This is churning in my Cuisinart ice cream maker as I type this. I’ve used coconut cream and so far this is turning out just fine. It’s about halfway through and I just remembered to add some organic coconut shavings with some organic sugar I had toasted and ground up in the coffee grinder last week. It’s been going for about 25 minutes and it’s not totally creamy right now, but the taste….. the taste is soooo good! I can’t stop myself from dipping a spoon in and testing it. Was hoping to make this ice cream for a dinner party this weekend, but I’m a little nervous to make it given the comments above about the curdling and hard coconut lumps forming in the vitamix. Any advice on how to avoid those issues? Thanks and love your recipes- making your carrot noodle pad thai for friends for dinner tonight! Hi! Since then, we have re-tested and updated the recipe so you should not run into those issues! I used full fat coconut milk and still had a problem with the fat forming little hard fat lumps in the ice cream. It certainly wasn’t as creamy as I was hoping for. Did I do something wrong? Unfortunately when I blended the ingredients (even without the coconut oil) it split into liquid with a ball of coconut fat in the middle. Had to throw it out. Maybe the salt made this happen? Bummer. I tried this twice and it worked neither time. Made with coconut milk, it turned it more like a granita crystaline and lumpy with hardened bits of coconut fat. I made it for a birthday and so was very disappointed. I’m not sure you should be posting recipes that are not fully tested and reliable. I followed your recipe and then doubled it using Simple Truth coconut milk from the carton that had 5 grams of fat per cup/80 cal., turned out delicious! Thank you much! So I used Goya coconut cream but I didn’t see anywhere in recipe to drain the oil so I dumped it all in together. I don’t have a blender at the moment so I used my food processor – which probably wasn’t fast enough but the consistency was all wrong. It didn’t look like ice cream at all- and wasn’t freezing either. It had more of the consistency of a runny pudding. I also didn’t have the ice cream maker. I think it was the oil. I would try next time and use coconut milk instead. The flavor of this runny pudding , lol, is good, but it’s definitely not what I was going for. I wish I was able to post a pic of what it looked like. I’m not going to rate this yet because technically I haven’t made it yet. The taste is absolutely delicious (!!!) but like others have commented, my ice cream separated. I’m the only one eating it so it doesn’t matter *that* much to me. My only guess is the 1/4″-1/2″ thick layer of coconut oil at the top of the TJ’s coconut cream. It didn’t really blend well in my vitamix and it just clumped up in my ice cream maker. That said, I’ll definitely try it again, but will either scrape off the oil or use the full fat coconut milk instead. Can I half this recipe if I only have 1 can of coconut cream? I liked this recipe. However, When I out the coconut milk (unsweetened, full fat) in the blender, it curdled in about 30 seconds. i had to throw it out and start again and only blend it for about 10 seconds. I used 1/2 coconut sugar which was a bad idea. It is the color of brown sugar. The second batch I used maple syrup which was fine. Can you tell me what to do if it curdles again . i will follow your recipe completely next time. i was trying to avid a lot of sugar. Thanks! I was super excited to make this, but for some reason while blending my coconut milk on high, it separated. Do you know why that is? I used full fat coconut milk (1 can), organic cane sugar(1/4 cup) and some vanilla (1tsp). So I’m made this. I added chopped up dark chocolate covered coconut pieces. Oh muh gawsh. So so good! I love your recipes. I love this ice cream! I have tried other ice cream recipes using coconut milk, but it was more like ice milk, wasn’t creamy or delicious like this one. I didn’t have a vanilla bean so I added maple syrup and walnuts and it was wonderful! This recipe did not work out for me at all, even with the blender. My Trader Joe’s coconut cream was separated in the can and never combined in the blender. Once I put it in my ice cream maker it just separated further. It looks and tastes horrible. I tried taking it out and blending it with no luck. I tried this recipe twice yesterday night with high quality organic ingredients but, as others have experienced, the curdling of the mixture during blending kind of spoilt the recipe.. The mixture tasted great but texture didn’t look like ice cream at all. I ended up having to throw it away as I couldn’t bring myself to serve it. I’d suggest putting in a note to let others know to heat the entire mixture after blending (then cool before churning, so that the coconut oil can be incorporated into the mix properly)? I have noticed that there are some canned coconut milk that has added thickeners. When making ice cream with coconut milk, should i use the one with or without thickeners? I don’t know what I did…I followed the recipe but it never froze!! I put it in the ice cream maker and it was cold and think but didn’t freeze like the chocolate recipe I made…so I figured maybe because it’s a bigger recipe it just needs to go in the freezer. So I left it in the freezer all night and the next day…and it’s still thick liquid!! Any idea why?? I have never had anything not freeze except alcohol in the freezer! what did i do wrong? i used trader joe coconut cream. I am so excited to make this ice cream. Do you think it can be beneficial for use this recipe for commercial purpose? Please let me know your opinion. Hi Jay! Not sure I follow. Do you mean for your business? Yes, I run a small restaurant. I made this a few weeks ago with home made coconut milk. It came out more like water ice. My kids still loved it. Fast forward to today I bought two cans of organic coconut cream from Trader Joes and I followed the recipe and used the blender except I took the coconut oil out of it to see if I would have success that way. Mid churning I looked at it and it was mostly rock solid (resembled the cream from the top of the can.) So I took it out, blended it all again and added some coconut oil. Now its gritty. I just wanted to comment because everyone seems to think its from the coconut oil, and I have had that happen to me in other recipes, but it happened to me even without the coconut oil. I haven’t read all of the comments, but is there any way someone has salvaged the grittiness of it? Regardless, thank you for this recipe to try! I have been trying to get a good dairy free ice cream recipe. Hi! I tried this without the coconut oil, trying to omit some of the fat content, and it seems to have turned out! 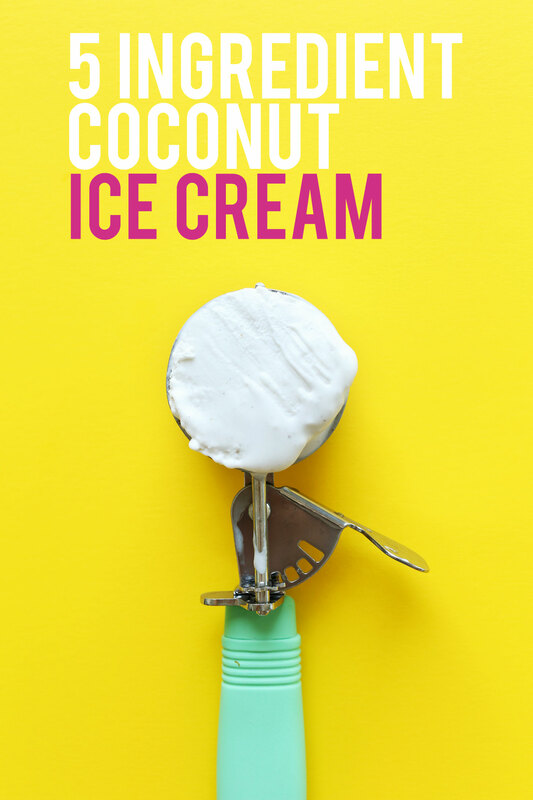 In my neighborhood, there’s a dairy-free ice cream shop that uses coconut cream in a lot of their recipes and this recipe tastes exactly like theirs, at a fraction of the cost! I’ve tried making my own vegan vanilla so many times but like others have noted in the comment section here, when the mixture is chilling in the fridge a hard layer forms on top. When I put it in the ice cream maker that hardened layer turns into little white chunks that look unappealing. I think the solution is two-fold. One, allow the heated up mixture to become room temperature before chilling it in the fridge. There’s something about going from hot to cold quickly that seems to cause the hardened layer. Two, I think using coconut cream specifically, as opposed to canned coconut milk, even if it’s the full-fat kind, that helps the mixture remain creamy and not harden. One other thing about using full-fat canned coconut milk in my ice cream recipes is that it has been too hard to scoop right out of the freezer, but with the coconut cream, the ice cream can be easily scooped from the freezer. I find canned coconut cream at trader joes. I hope this helps! I’m sorry to be confusing…your recipe doesn’t call for heating up the ice cream mixure to combine all ingredients, rather you use the blender! Many of my ice cream recipes do call for heating up ingredients on the stove. So with your recipe, I think the key to not having that hardened layer of coconut is to buy the canned cream, not milk. Several people asked if you separate coconut liquid from the cream and use only cream, and I can’t find the answer. So do you use both or just the cream part from the can? I was getting ready to make this and noticed the reviews on gritty texture and separation. Is the recipe supposed to use “coconut cream” or “cream of coconut”?? Both come in sweetened and unsweetened varieties but have totally different textures. Thanks! When I tried this, the mixture continued to have small white fat clumps (like tiny lumps half the size of a piece of pencil lead) during blending even after 2-3 minutes (I don’t have a vitamix I was working with the fastest speed on my unit, but it won’t ever heat and cook the ingredients like a vitamix). I poured the mix which looked relatively smooth into my cold icecream bowls (I have the two sided frozen tub kind of maker that’s electric). And the fat separated out and lumped up almost immediately and rose up to the top in large chunks. I put it back in the blender for 4 minutes and it smoothed out … and poured it into an already churning icecream maker .. and while it looked smoother it never turned to soft serve. As a result — when frozen it lacked some volume/fluffiness. Had some crystallization and grainy bits of coconut fat or coconut oil dispersed throughout. I’m going to again. I was hoping to find- if the mixture being slightly chilled or slightly warmed helps better with getting a smooth blend? Unless i can get more feedback I got the impression maybe I should start warm (i’m going to warm my coconut cream in a water bath and shake the can before opening), blend, chill a bit, blend again? It seemed to blend smoother once chilled — however fat doesn’t melt until warm so i thought i’d start there. The taste was good, maybe a bit too intense on the vanilla once frozen (may scale it back a tad), I need the texture right though before I can give it more stars. It did taste very much like icecream- so it’s a start. << Update from original poster. I went to buy more coconut cream to try this again (incidentally my store only carries 5.4oz tiny cans of the unsweetened coconut cream) and they were out. So on a lark, I put the weird textured frozen mix back into a blender, and it made a handsome looking milkshake. I decided to put it BACK in the icecream churner now that it looked smooth (and the churner was re-chilled) and so far it looks pretty smooth and handsome. I hadn't frozen it yet, however maybe this trick will help others salvage lumpy batches. Hi Dana, which ice cream maker do you use? Hi Joe! You can! Check other’s comments to see how they did it. Good luck! I recently became vegan about a month and a half ago and have been absolutely adoring your page and making all of your recipes! They ALL have been a hit in my household! I can’t wait to make this ice cream for my husband. He’s an ice cream fanatic! It will be my first time making ice cream and my question is would I be able to sub vanilla bean paste for the pod (powder)? Thank you for sharing your response and sharing your divine recipes! Hi! I haven’t tried it but that might work! If you give it a try, report back on how it goes! Just did it few days ago and result, texture and taste is fantastic and the only reason I will not do it again, is because It give’s me a lot of gastric backward flow, so if you have this problem, this is very bad for it. Pretty sad…. I made this a few months ago and followed the recipe exactly (the blender method). It turned out wonderful. I just made it again today and the mixture separated/curdled in the blender. It don’t think that it is a recipe problem, but is either related to (1) how long/hard it is mixed in the blender or (2) the coconut milk. These are the only two things that I did differently. My hubby was in charge of the blender and mixed this at top speed. One minute it looked great and the next minute it looked like cottage cheese. I also used a different brand of coconut milk. If I figure out the issue. I will let you know. I made this tonight. The coconut fat in the whole fat coconut milk separates from the milk. It doesn’t matter how long you blend it. I followed the recipe exactly as stated and it never mixed properly. Would I be able to substitute the cane sugar for stevia in this recipe? Hi! Others in the comments gave stevia a try and did not have much luck! Take a look when you get a moment! Good luck! I just made this and scooped out a bowl of the finished ice cream to eat right away – it is SO GOOD!! First off, when I put all the ingredients into my blender, I was so worried to see that the mixture appeared curdled. I just let the blender do it’s thing though and after a few minutes, the mixture came together. Into the ice cream maker it went – I have a Cuisinart and 30 minutes later, I was snacking on the best ice cream to have come out of my machine. * I used the 1/4 cup substitution of Agave syrup, plus about 1 Tablespoon. Hi! This is the blender we use! I also had the problem with the mixture curdling when I added the coconut oil to the other ingredients, even in the blender, but only with some coconut creams. I imagine that the warm oil hitting the cold mixture created some emulsifying problems. My fix for it was simply to pour the curdled mixture into a pan, heat gently until everything melts and comes to the same temperature (which solves the separation problem) and then cool down the mixture before using. Love your blog, always a source of inspiration. Another poster may have brought this up (I tried to read through the comments but there’s quite a lot of them at this point). Could the separation problem be caused by the difference in coconut cream brands? I’ve noticed that some coconut creams are just coconut and water while others (I believe Trader Joe’s is one of them) use additional stabilizers. Perhaps the additional ingredients also help stabilize the custard? Thoughts? Hi! Thank you so much! On the coconut cream side of things, that is so strange! Some people have mentioned having trouble with the coconut oil separating but I never have, despite rigorous testing. Perhaps leaving that out next time would help. Sorry it didn’t work out this time! I’ve found most vegan ice creams I tried turn rock solid like ice when stored in the freezer (even despite being made in an ice cream machine), so unfortunately I need to make vegan ice cream just one portion at a time which means I don’t make it often. Can someone tell me if this recipe can be stored in the freezer without turning solid as a rock and becoming unusable? I’m really hoping I’ll one day find vegan ice cream I can store in the freezer, and maybe this is the one. Hi! Though best when fresh, Vanilla Bean Coconut Ice Cream will keep in the freezer for up to 10 days! Thank you, I’ll try it soon. By the way I got your book for Christmas and it seems to be my recipe book with the highest percentage of recipes I want to try, almost any page I open it to it’s something I want to try, it’s likely to end up being my favorite recipe book. I just got an ice cream machine and I’ve never used it before so I tried this recipe but it didn’t work at first because I realized the freezer bowl wasn’t completely frozen solid and my ingredients hadn’t been refrigerated beforehand. So I put the ingredients in the fridge overnight, turned my freezer to the coldest it could go, put the freezer bowl back in, and tried again in the morning. It turned out great! And in my machine only took about 30 minutes. I used 2 cans of Iberia brand coconut milk and since I didn’t have a vanilla bean, I did as another reviewer said, and just added another teaspoon of extract. Best Ice Cream I have ever made! I found some lovely Madagascar vanilla beans from slofoodgroup.com, which I used here and it was just wonderful! thank you for the lovely recipe. I just tried the new technique with the blender and it is not looking good. What did I do wrong? Blend it too much… not enough? I used one can of coconut cream and one can of coconut milk because that’s what I had on hand. It looked good when it was blending but when I stopped it there were little clumped up bits floating. I thought those would churn in (using kitchen aid ice cream mixer), but the whole thing is gritty. I tried throwing it back in the blender before freezing which helped a little, but its still pretty grainy. Hi there! I’ve tested this recipe several times and have never had issue with the clumping. But some people have had trouble with the coconut oil so next time I’d just suggest leaving it out! does that mean you don’t put any cane sugar and only put 1/4 cup of agave or maple syrup? or does that mean you do 1/4 cup cane sugar and 1/4 cup of agave? That would mean 1/4 cup sugar + 1/4 cup agave. Good luck! like other comments i had a real problem with the coconut oil separating into little pieces, making the finished result very grainy and not like creamy icecream at all, I feel as if the coconut oil was left out and replaced with a thickener, maybe it would create a better result. The thing is coconut oil will always freeze quicker than the coconut cream because its freezing point, so i think that’s what makes it separate in the icecream. I followed the recipe to the tee and still was disapointed:(( however I have always loved all your other recipes Dana and this one just seems to be a dud for me unfortunately. I made this yesterday. Which means I just ate it now after a night of freezing, and then we were out of the house for the day. We love it! Now to chose what to make next . . .
You can just leave out the coconut oil but it won’t be as creamy. Yes you can use a loaf pan and mix it every once in a while, but it won’t be as creamy. Good luck! Can you substitute stevia for the sugar? I have the same question: Can you substitute Stevia in the raw or something similar as a sweetener. I’m trying to beat diabetes. Hi Debi! Others in the comments gave stevia a try and did not have much luck! Take a look when you get a moment! Good luck! Hi Dana! I have a question, I don’t live in the US and I can’t find the vanilla bean or paste, what can I use to make the flavour even better? And if I would like to add pieces of real or dried coconut, how much and when is the right time to add them to the mix? Coconut milk frozen yogurt is the best! I needed to giveaway my frozen yogurt producer when I was moving yet I as of late purchased myself another and I adore it to such an extent. Adding this to the rundown of frozen yogurts I need to make before it gets cool!! The coconut oil ruins it. There are hard lumps of oil that never fuse into the frozen yogurt . Best ice cream I’ve ever made!!!!! Thank you!!! I love your website and I especially love this recipe! My 9 year old daughter and I are going to work our way through your vegan ice cream recipes. One question for you, we noticed that the recipes vary quite a bit (some call for nuts, some call for thickeners (Xantham gum, optional arrowroot powder). We were just wondering can this recipe be adapted just by adding different flavors? Why do the other recipes require soaked cashews and almond milk, etc? Again, the site is amazing and we love your recipes. If you have time, would love to hear more about the different ice creams. Hi Lesley, glad you’re enjoying the website! The blog is a great excuse to test out different methods of making things like ice cream! Cooking can be a puzzle and sometimes there are multiple ways to get to the same place! Cashews can add great flavor and a creamy texture that I find works well for some ice creams. For the vanilla bean coconut ice cream, I wanted to emphasize the coconut and vanilla flavors and make sure they didn’t get masked by anything else. You certainly could adapt this recipe! For example, try it with coffee or throw in baked apples and definitely let us know how it goes! Your chocolate recipe seems much different yet I would think you take away vanilla bean and add cocoa and it would become chocolate. There was only one can coconut milk in chocolate . I made it. Was delicious and decadent even without added vegan chocolate just cocoa. What kind of cocout cream do you use. Only ones I’ve seen are 167 ml. Can you do one can of coconut milk and a few cans of cream? I just made this and it’s soooo good! I was quite impressed! The coconut taste is not overwhelming, it tastes very similar to my grandma’s non-vegan homemade ice cream recipe! I was kind of scared because I used coconut milk and I wasn’t sure if it was full fat but it worked fine. Definitely will make this again!!! I don’t like coconut, but decided to try this one ouy, and I LOVED it. Great recipe. I always use Trader Joe’s coconut cream and not coconut milk and it comes out great. I also use raw honey for the sweetener. I think that this is better for me. I do not put in coconut oil because it does not mi x well. I use my Cuisinart food processor and it works great! This is what I do and it works well: 1. put in frozen bananas and mix in food processor until formed little chunks. 2. put in at least 2 tablespoons of honey. 3. Put in 4 tablespoons of TJ’s coconut cream. 4. Put in any frozen fruit(frozen is the key). 5. mix well. Serves 2 because I have the small food processor. Double or triple the ingredients for a larger food processor. SO Good! Thanks Lana! I recently retested the coconut oil in the recipe and it worked great. I’m making this for a birthday party this weekend. Does it work OK to triple or quadruple the batch all at once in the ice cream maker? Or is it better off done in a few small batches? You’ll need to do it in two batches! Is this the recipe you were making on Instagram yesterday? Was looking for a coconut milk ice cream recipe to use with my new ice cream churn and found this! Didn’t have cane sugar so tried it with regular white sugar. It was delicious! Not sure what the difference is between cane and regular white sugar. Is it sweeter? I just made this. I have an ice cream maker with a compressor so what I do is prepare the mixture and put it in the fridge over night. Then make it the next morning. Since it’s cold it takes very little time to do. I love this recipe, and I like the addition of the coconut oil. I was using eggs before which I really would rather not use, but the extra fat helped, the ice cream was not as hard as a rock. I also used coconut cream, not milk and I used my vanilla bean that I had infused in rum many months ago so it was sooo yummy. You get only the taste no alcohol, there’s not enough rum in it to say it’s alcoholic. I can’t wait to try it tomorrow. The taste of the liquid was amazing and I’m sure the frozen product will be just as amazing!!! Yum! This is sooo good (and so easy)! I used a little less sugar—still nice and sweet and an extra tsp vanilla extract because I didn’t have vanilla bean. Adding coconut oil to ramp up the creaminess is brilliant. Definitely making this again! Thank you! This recipe is phenomenal. I tried it today, since I have a few cans of coconut milk. Even my picky 4 year old loved it! I will definitely be making this again. Thanks again. I’ve not tried recipe yet, wondering, for some one trying to up metabolism, and not consuming sugars, or chemical substitutes, what anout raw stevia? Thanks for any help. Hmm, I haven’t tried that yet but if you do, let me know how it goes! How can I keep the ice-cream from getting icy? Anything I can add other than extra sugar? I tried making this today but I subbed the vanilla extract for pure peppermint extract & I added a few leaves of spinach for a green color to make it like mint ice cream. I am kind of worried though because when I was scooping it into the tray it was more like watery slush instead of soft serve ice cream. I had been churning it for over an hour! Do you think my subs caused this or what else could of went wrong? Hi!!!! Can I use coconut cream instead of the milk? Thought I’d answer this one. Coconut milk is always separated like that because the fat rises to the top like cream does in unpasteurized milk. But the solid and liquid blend together beautifully in a blender or with a hand mixer. A hint I learned from someone: when buying coconut milk, shake the can and listen for the slosh of liquid. The less of that you hear, the more of the creamy solid stuff there is in the can. Oh my goodness! This stuff is like crack, it is so addictive! Even my daughters, who aren’t big fans of coconut, loved this. I like it better than dairy vanilla bean ice cream, and I’m a long time vanilla bean ice cream aficionado! Just an amazing recipe! Thanks so much! 1. Too much air? Not possible using any machine made on planet earth. 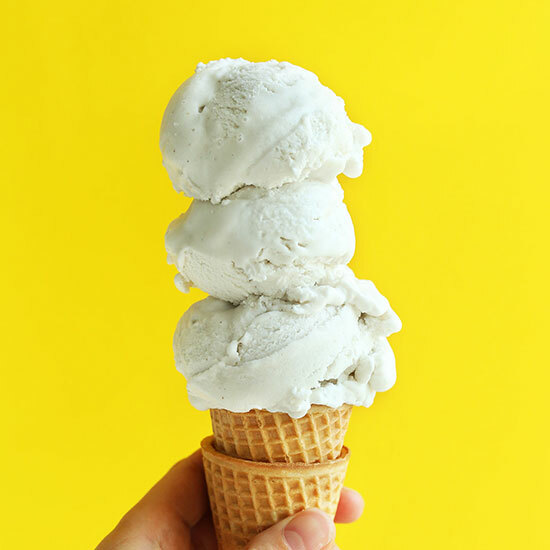 Air in any ice cream makes it lighter, smoother (as in smaller ice crystals), fluffier and softer (as in easy scoop), etc., and certainly not a rock solid hard brick. So you’ll need to look elsewhere for an explanation. b) Try xylitol instead of stevia. Not only will it lower the freezing point of your ingredients (just like regular sugar), but it is also a proven bactericide, and is free of the ‘aftertaste’ that some ppl complain of when stevia is used. Oh yeah – good luck. @ Susane – Read my comments just above yours about using cream instead of oil – it will solve your lump problem, and give a better result to boot. @ Kifah – Not only should you use coconut cream & coconut milk, but if you like it with ‘bits’, you can also dissolve 3 x 50g coconut bars in the milk over gentle heat for added coconutiness. Again, refer to my comments just above yours. Could I use coconut cream with coconut milk? THANK YOU for the recipe! One question though – we left the ingredients to chill overnight and the next morning there was a separation of a thin hardened layer on top and trapped liquid on the bottom. Is that normal? We ended up just breaking up the top layer into pieces and churning it all but even after the churning process there were still some mini bits of the frozen layer even after the churning… still delicious though!!! Just checking to see what the consistency of the ingredients should be after chilling it! Appreciate any feedback thank you! My first comment failed to appear for some reason, so here is my 2nd & last attempt – sans link, (just in case that was the cause) and much modified. To all those who have been disappointed with the results, try coconut cream instead of oil. Google it for sources in your country. I made it with Sainsbury’s coconut cream – rated as one of the best of its kind – and it worked fine. It made a superb, smooth, creamy ice cream, no lumps, and I didn’t even use heat or an ice cream maker. The missus loved it – one of her favorite flavors. I can’t rate the recipe, coz I didn’t follow it. I knew from experience that using coconut oil was asking for trouble. Not only is it solid at room temperature, but freezing makes it practically rock-hard, and integrating it with the other ingredients requires a chemistry set and a couple of industrial processes that are best avoided. I hafta admit, it remains a complete mystery to me how anybody managed to get a good result from this recipe. PS I should also add that coconut cream has a stronger flavor than coconut oil, which is quite bland by comparison. In fact, I’m hard pressed to come up with a single reason for using oil in this recipe. Cream whips it in every department (pun intended), and I hope that Dana will take note and amend her recipe accordingly, if that’s at all possible. My ice cream is rock hard after being in the freezer for a day- dos I leave it in the ice cream maker too long, or did I take it out too soon? It only took 10 minutes to get to a soft serve consistenc an. Delicious flavor on day one though! The coconut oil ruins it. There are hard chunks of oil that never incorporate into the ice cream :(( Wasted ingredients. I’ve updated the recipe with a new method as several people had trouble with the coconut oil separating, which I never experienced! However, I believe the changes will fix any separation. Sorry for the confusion! I have hypothyroidism so I generally try to avoid all canned foods – do you think it would be possible to make the ice cream using homemade coconut milk (desiccated coconut + water, then strained? ), or would it not be creamy enough? I am trying to reduce/eliminate refined sugar. Do you think date paste would be a decent sub for the sugar? You are my “go-to” site for fabulous recipes – ALWAYS!! I’m entertaining beginning my own blog & it’s because of your inspiration – you’re amazing!!! I have tried many times to make coconut milk ice cream, but whenever I put the mix in the refrigerator to cool, a hard waxy layer forms on top. If I go ahead and put this in the ice cream maker, there are unpleasant chunks of hardened coconut milk in the ice cream –yuck! Do have any solutions to make the mixture stay mixed while cooling enough to put into the ice cream maker? “Greate” VANILLA BEAN COCONUT”The interesting thing is I was lactose narrow minded for the majority of my initial youth, which implies some place along the line I chose I was going to eat dairy in any case and I don’t think my guardians had the heart to let me know no. So frozen yogurt it was, until quite a long while prior when my body close the entire operation down. Much obliged to you such a great amount for a formula without cashews. My children are allegic to all nuts, and I was considering how I could make a vanilla frozen yogurt with coconut. Your mango raspberry coco sorbet has as of now been a colossal hit in our home, can hardly wait to attempt this one. We made this last night and my husband raved about how good it was. He can’t eat dairy or gluten, so we frequent your blog. We also love your gluten free pizza crust. Thank you for your simple, delicious recipes! Like some others, the coconut oil separated from the coconut milk while in the fridge. I thought it may have been caused by me adding solid coconut oil to the mix on the stove, so I decided to try again. I strained the solids from the liquids, melted the solids, used an immersion blender to whisk while slowly adding the liquids to attempt to emulsify the two, placed the mixture back into the fridge and the solids still rose to the top. I won’t be adding coconut oil to my next batch. This is the first recipe of Minimalist Baker that has not met, or exceeded really, my expectations. I am sad! Annalisa, I didn’t make this formula, however a comparable one that did not call for coconut oil. I utilized full fat coconut milk, pure sweetener, and included cocoa powder for a chocolate frozen yogurt base. Mine still turned out grainy without including coconut oil. It might be the brand of coconut milk (Chaokoh) that I utilized… I’ve utilized it once before as a part of frozen yogurt and I couldn’t have cared less for the grainy surface it gave in the wake of solidifying. Later on I might take a stab at utilizing an alternate brand of coconut milk…. Great “This formula is great, the main protestation I have is including the coconut oil… putting the blend into the cooler subsequent to warming it up on the stove top makes the coconut oil set in the refrigerator and results in huge surface pieces when it chills off in the ice chest before adding it to the frozen yogurt producer… .I wound up scooping them out before adding to my dessert churner. I think in future with this formula I won’t include the coconut. This recipe looks amazing. I’m definitely trying this tonight. Kind of a newbie here but when you say to use a vanilla bean pod, do I used the whole vanilla bean stick? Thanks! 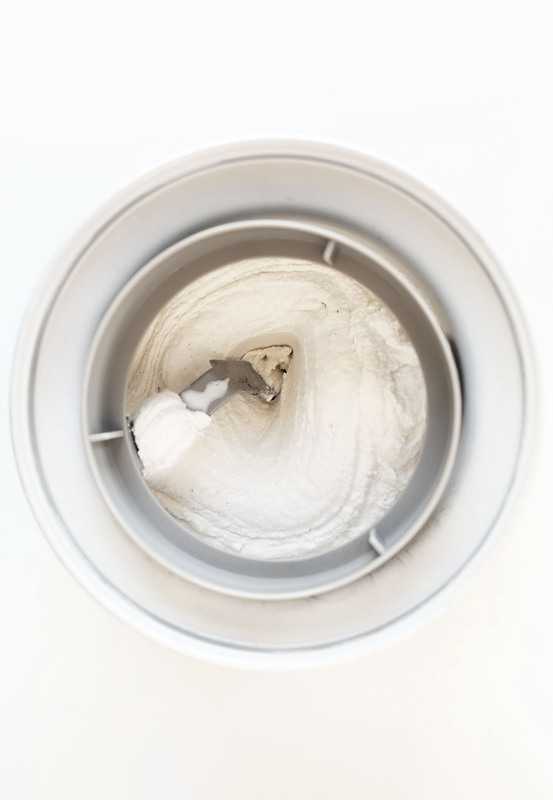 Do you use an electric or manual ice-cream maker? I have never liked ice cream (as a vegan or not), but I am surrounded by people who love ice cream. I have made this vanilla ice cream twice now and both times it has been not only the most delicious ice cream I’ve ever had, but also an ice cream I can truly get down with. An ice cream I can crave. But then again, so is the chai ice cream from your blog (which I also love). Love them both, and hope to try more of your ice cream recipes in the future. This recipe is good, the only complaint I have is adding the coconut oil…putting the mixture into the refrigerator after heating it up on the stovetop makes the coconut oil solidify in the fridge and results in big surface chunks when it cools down in the fridge before adding it to the ice-cream maker….I ended up having to scoop them out before adding to my ice-cream churner. I think in future with this recipe I will not add the coconut oil. Hi Dana! I make tons of your recipes, and I love them all – especially the vegan ice creams! 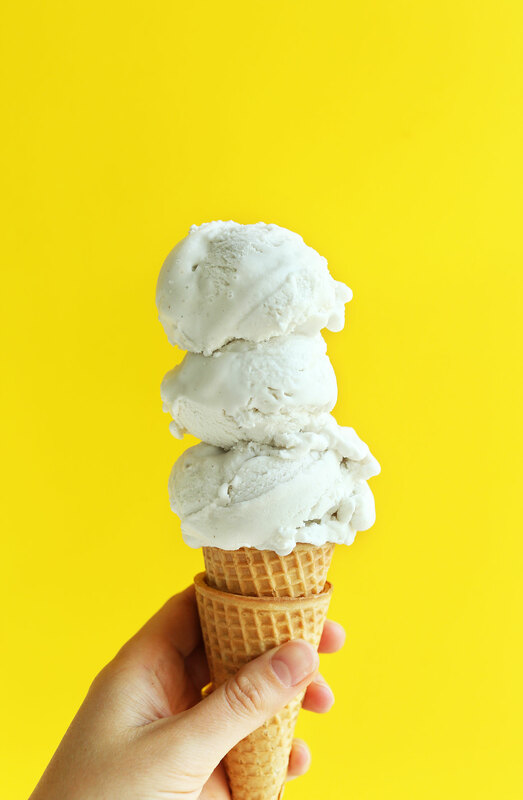 My fiancé has been begging me to add protein to your ice cream mixes, so I was considering adding a few scoops of vanilla flavored vegan protein powder to this recipe in particular. Have you ever tried adding protein powder to ice cream? I’d love your opinion! Thanks again for consistently filling my kitchen with delicious vegan recipes! I have some coconut cream left over from another recipe. Can I use them up with combination of the coconut milk required? I was just wondering- I’m looking into purchasing an ice cream maker to make coconut ice cream and other dairy-free gelati and sorbets. I am aware that there is quite a difference between a ‘gelato’ maker and an ‘ice-cream’ maker in that ice-cream makers incorporate a lot of air into the churning to make it firmer and thicker, whereas gelato makers ensure no air gets into the mixture at all to make it creamy and rich. Do you think this would make a difference in the effectiveness of making dairy free ice-creams, specifically coconut milk ice creams? I don’t want to buy a gelato maker and end up with coconut slush! And at the same time, I don’t want to buy an ice-cream maker and end up with an icy frozen block of coconut! Any insight you may have would be incredibly helpful! I’m not exactly sure how the coconut milk would react to these ice-cream making methods. Nadia, if you haven’t already invested in an ice cream maker, Cruisinart has 1 that has an ice cream paddle as well as a gelato paddle. In Dec of 2015 it was about $300. It has a compressor so no need to freeze bowls in the freezer. I love mine but have never used the gelato paddle so am unable to advise on its’ effectiveness. I just made this and I love the flavor! It is a little oily – what is the purpose of the coconut oil? Just wondering if this is something i could omit next go around :) Thanks! Is the coconut oil necessary? I read in the comments that the ice cream made from some of the other people turned out gritty from the coconut oil not emulsifying with the coconut milk. To avoid this can I just leave it out? Can you also answer this in the time span of 12 hours, haaha thanks!! Annalisa, I did not make this recipe, but a similar one that did not call for coconut oil. I used full fat coconut milk, cane sugar, and added cocoa powder for a chocolate ice cream base. Mine still turned out grainy without adding coconut oil. It may be the brand of coconut milk (Chaokoh) that I used…I’ve used it once before in ice cream and I didn’t care for the grainy texture it gave after freezing. In the future I may try using a different brand of coconut milk. SO weird! I’m sorry it didn’t work out. So many others have had success! What brand of coconut milk did you use? C – I had the same problem. I did it without an ice cream maker the first round. I tried again with the ice cream maker the 2nd time and still came out with a solid chunk with a fat layer on top! Not sure if maybe I didn’t churn it correctly?? is there anything I could use instead of cane sugar? Try substituting coconut sugar, or maybe even brown rice syrup. I haven’t tested these options, but they would be my top next choices! I made this using about 6 tbsp brown rice syrup and 1 tbsp Xyla (xylitol granules), to make this fructose-free and it worked great! Thanks so much for giving the technique for doing this by habd–I just picked a night ahen I was having a Downton Abbey marathon and so could remember to whisk it once an hour! It turned out really well. Tonight I’m going to try a version with coffee and cocoa nibs, and I also plan to try a version with lavendar. So excited to have found this recipe, I can’t tell you! Without an ice cream maker, so could you freeze into a ice cube tray. Then blitz in a thermomix? The ice cream turned out perfectly delicious. I love your recipes, Dana! Made this for Thanksgiving….was perfection! Thank you for sharing! Whoop! So glad you enjoyed it, Karen! So kind! Glad you enjoyed it, Chari! Thanks for sharing and best of luck with your new kiddo! My try also resulted in the coconut oil solidifying on the top after being chilled. This didn’t surprise me when I saw it, as coconut oil, like most fats, does this (you know when you get a casserole or a curry out of the fridge, the solidified fats are always on the top and only melt when heated?) I wondered if maybe the icecream maker would break it all down but sadly no…it’s all in there at the moment churning around with great big chunks of hard coconut! The flavour is beautiful though. If this tastes anything like your sea salt caramel coconut ice cream I will be in heaven! Can’t wait to try it. It’s like that but more pure! Hope you love it, Margaret! What kind of Vanilla Powder do u suggest to use? I got mine at Whole Foods! But a scraped vanilla bean would also work well! What size ice cream maker do you use? I like your recipe, thanks ! Do you use the water of the coconut milk can too or just the meat? This is my very same question too! Do we use the liquid part in the can too? Please let us know! I found this great article on using the ice cream maker that others might find useful too. It explains reasons one might get “grainy” ice cream. OMGoodness vanilla bean and coconut = amazing! Thanks for sharing. Can’t wait to try this! This ice cream looks perfect, creamy, and rich. I don’t have an ice cream maker, but I do have a good hand mixer. I’ve used it to make ice cream in the past. Would this work with fresh coconut milk? I scooped out the inside meat of a fresh coconut and blended it with water. It’s in my fridge now with a thick layer on top and thin liquid on bottom. Would it work the same as canned coconut milk? I’ve never tried that! But if you do, let me know how it goes! This looks so good! I will need to invest in an ice cream maker! Do you think this would work with home made cashew milk instead of coconut milk? Definitely plan on trying this! Thank you for the recipe! I think so! Let me know if you give it a try! That would actually be perfect!! Holy cow this stuff is creamy! I ended up using two cans of Thai kitchen coconut milk, and it’s crazy how much the chilled, pre-ice cream form of this tastes like actual custard. It kind of blew my mind. I did run into a problem with the coconut oil — I brought everything to a simmer, removed from heat, whisked thoroughly, etc., but after chilling ended up with a thin, hard, semi-opaque layer on the top of the custard base. Pretty sure this was the coconut oil, which hadn’t combined fully with the coconut cream and sugar, and because I didn’t have time to reheat and rechill, I used an immersion blender and hoped for the best. I kind of knew this wouldn’t work but you never know? It — predictably — didn’t emulsify entirely, and ended up effecting the end result. Still a super creamy ice cream, but with a sort of underlying grainy mouthfeel — It was subtle enough that no one mentioned it but noticeable enough that I want to keep experimenting. In the future, because I’m totally trying this again next week, I’ll either eliminate the coconut oil from the recipe, or be sure to let it simmer for five minutes before taking it off the heat. I added chocolate ‘magic shell’ (chocolate+coconut oil, obviously…) and the end result was pretty incredible. Thanks for the awesome recipe — my dairy-free friends were thrilled!!! Hmm, that’s so odd! I haven’t ever had that experience when adding coconut oil to frozen desserts. Perhaps leaving it on the heat a little longer and really whisking vigorously will help! Glad you still enjoyed it. YUMMMMM! I thought I’d miss dairy after giving it up, but like you said…it’s hard to miss it when there are incredible dairy alternatives out there! You are the ice cream queen, girl!! These recipes are making me seriously consider getting an ice cream maker…. DO IT. Seriously! Best purchase ever! I can stop looking at the pics, so nice and delicious. Hi Dana, Please what ice cream maker did you use here or do you recommend for someone (me) who has never used one and would love to get one to start making nice treats such as this. I’d greatly appreciate a response. Thank you! Hi Dana! So inspired by your cuisine choices and food styling. Will definitely try the non-machine version of the recipe and see how I do. Coconut milk ice cream is the best! I had to giveaway my ice cream maker when I was moving but I recently bought myself another one and I love it so much. Adding this to the list of ice creams I want to make before it gets cold!! My system cannot tolerant uncooked milk. I don’t really understand it, because the milk has been pasteurized. Anyhow, I found out that I can consume milk if it has been heated, boiled. So I can consume ice cream that is made when the milk has been boiled. I cannot eat soft ice cream nor milk shake. They just go through me within less than 15 minutes. Maybe this is of some help to those who have the same problems like I do but does not know that they can drink or consume milk when the milk has been boiled. If you want to make ice cream cream without an ice cream machine, you can use the old fashion ice cube maker. I used to make them all the time. We call them ice-blokjes (diminutive ice blocks). Have you ever tried making Fruchteis? It’s something that I can find in almost every gelato shop I’ve visited in Germany, usually in several fruit flavors. It’s delicious and has the best consistency, but it’s amazingly dairy-free! Hi Dana, I just recently discovered this blog, and I love it! Like many of us I struggle with long recipe lists and complicated directions but you make it all look so easy and want me go to prepare this ice cream right now. Coconut is my old time ice cream flavor favorite, so this is definitely a plus! Thanks for sharing with us. Oh mannnnnnn this looks sinful! Hi Dana! Your recipes are always mind-blowing but when you make creamy anything the world just stops. You make magic I swear. Thanks so so much for the recipe! PS. your image says “exract”. I made this today and the flavor is great but when I took the mix out of the fridge there was a hard layer on top. Probably the coconut oil and some of the coconut milk. I tossed it in my vitamix but the ice cream had a grainy texture once made. What’s your thoughts? So odd! I always add coconut oil to my recipes and it never turns out chunky. Did you blend it well? Was it melted? If this happens, can the mixture be reheated before churning to make it smoother? My ice cream maker has a compressor so I don’t have to chill the mixture or freeze a bowl before churning. That should work! However, I’d chill it again once more if you have to reheat it, otherwise, it likely won’t freeze when churning. Heat it in a double boiler until it almost boils! This will smooth out any big chunks. That is so strange! Some people have mentioned having trouble with the coconut oil separating but I never have, despite rigorous testing. Perhaps leaving that out next time would help. Sorry it didn’t work out this time! I had the exact same issue. Split completely as soon as it was in the blender. I have warmed it up to melt the solids so hopefully it’ll work out this time. I’ve put it in the freezer now so we shall see! Hi! I’ve heard MCT oil is the way to go as it makes the ice cream softer and unlike coconocit oil it doesn’t separate. Is this new recipe soft without any oil or should I add 1 -2T mct oil? Hi! It is already quite soft, so I’d say you’re good. I adore coconut anything! I will have to try this before I put my ice cream maker away for the season. What a fabulous recipe. The texture looks absolutely perfect, too! (Says a fellow ice cream connoisseur in earlier years). haha I used to be such an ice cream addict too! As in, I ate huge bowls of ice cream every night with ALL the toppings. Good thing I was a scrawny kid. Now I’m plant-based, so unless my ice cream is made with bananas I don’t eat it!! I’d eat this Coconut Vanilla Ice Cream in a heartbeat though! This sounds delish and I love that there’s a way to make it without an ice dream maker! Your ice cream looks amazing! Thank you so much for all these dairy-free recipes, I’m thoroughly enjoying the ice cream with my cow’s and soy milk allergy. I was wondering, could I perhaps substitute the vanilla extract by one or two extra vanilla beans? Vanilla extract is nearly unavailable in my country unfortunately. Thank you so much again! I can’t wait to try this recipe out. Make your own vanilla extract by soaking vanilla beans in vodka. In about a month, you can no longer smell alcohol and voila, you have vanilla extract! All your ice cream recipes come out so perfect. It makes being dairy free so delicious. Thank you so much for a recipe without cashews. My kids are allegic to all nuts, and I was wondering how I could make a vanilla ice cream with coconut. Your mango raspberry coco sorbet has already been a huge hit in our house, can’t wait to try this one. YUM! And gorgeous photos. The yellow is genius. Looks fantastic. I have minimal cooking tools for the moment, but I definitely want to try this sometime! Every day I check in here see whats new of course it is always amazing. The 1,257 I love you blog is that you never have corn in your recipes! That is hard to get a way from because 1 I can’t eat it and 2 every body uses it. Thank you Dana! That looks amazingly like just normal Vanilla ice cream! Just want to take a minute to let you know how grateful I am for all of the education and tips you have to offer me as a beginning food blogger. I plan to take your photography course soon… and your video tutorials on setting up my website have by far been the most helpful of any other website I have navigated. You guys really do have amazing content and valuable products to offer. I look up to you guys as a rookie. You’re post on standing out through the noise has given me a lot to think about… and someday I hope to be as cool as you! Thanks again! Agreed! Hope you love it, Mel! And thanks for the kind words! I just got myself a new Cuisinart ice cream maker, this is the perfect christening recipe. Agreed!! Let me know how it goes, Celeste (beautiful name, btw). haha, being an ice cream kid sounds pretty awesome, actually! Well, maybe not for your parents. I could certainly live on this flavour! Right? Poor mom and dad. Hope you love this one, Katrina! You always have the best recipes, especially for beyond delicious non-dairy ice cream treats! Ah, thanks Liz! Hope you love this one! Hey Dana! I love your recipes <3 Any idea if I could make this with coconut milk powder?